(Nanowerk News) Graphene is a one atom thick sheet of carbon atoms, arranged in a periodic hexagonal lattice. It is famous not only for its remarkable electronic properties, but also for its exceptional mechanical strength and flexibility. To exploit these two last properties, researchers at Université Paris-Sud have draped a graphene sheet over square lattices of nanometer-sized pillars etched from silicon oxide (Nano Letters, "Strain Superlattices and Macroscale Suspension of Graphene Induced by Corrugated Substrates"). The pillars are either cones or cylinders, with a diameter of a the few tens of nanometer. They are produced by reactive ion etching of silicon oxide, through an electron-beam designed mask of aluminum nanocylinders. The large-area graphene sheet is produced by decomposition at high temperature of a methane/hydrogen mixture, on a copper substrate that acts as a catalyst. The graphene sheet is then transferred onto the pillar array using a polymer film. Transferred graphene on nanopillars. (a) Schematic view of graphene membrane deposited onto SiO2 nanopillar array. (b) Atomic force micrograph of graphene deposited on SiO2 nanopillars. 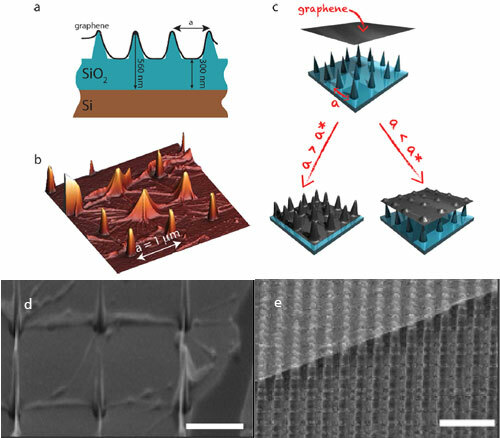 (c) Schematics of graphene (in black) transferred onto nanopillars array (in blue). For dense array (a < a*), fully suspended graphene over large areas are observed. At low array density (a > a*), graphene conforms with the substrate and forms highly symmetric ripples. (d) and (e): Series of SEM micrographs showing the behavior of transferred graphene membrane for 270 nm height silicon pillars. (d) the pillar pitch a is respectively equal to 2.3 and 0.25 µm. Scale bars lengths are 2 µm. Scanning electron microscopy and atomic force microscopy are used to detect the different ways in which the graphene sheet rests on the pillars, whose separation in the arrays varies between 0.3 microns and 4 microns. The scientists found a characteristic pillar separation (characteristic lattice constant a*) of the order of one micrometer. For smaller pillar lattice constants (a < a*), the graphene lays flat, fakir-like, resting on the tips of the pillars. For less dense pillar arrays (a > a*), the graphene hugs the substrate and pillars tightly, without tearing. A high stress thus occurs at each pillar tip, leading to a deformation of the graphene hexagons that was detected by Raman spectroscopy. Stress is also released via the formation of folds that are oriented parallel to pillar lattice directions. The density of folds results from competing energies, the elastic deformation energy of graphene, and the attractive interaction between graphene and substrate (stemming from the energetics of the transfer process onto the irregular, sharp substrate: electrostatics, van der Waals, capillary, etc…). In this work a variety of nanostructures has been created that can modify the electronic properties of graphene, either by periodic modulation of the electrostatic potential, or by periodic mechanical stress that can generate an effective magnetic structure. Both electronic transport and magnetisation measurements of these structures are underway to reveal the consequences of such mesoscopically stressed graphene.